Contempt of Court is a very grave offense anywhere in the world, as well as in India. Contempt of Courts Act of 1971 clearly defines the basic nuances in the subject matter. The first one refers to the civil contempt of Court. This is under section 2 (b) of the Contempt of Courts Act 1971. This happens when a court order in a civil case has been not been obeyed or carried out as was instructed by the Hon’ble Court. The disobedience can be regarding a judgment, it can be a decree, a direction, it can be an order, it can be a writ or it can even be any other process of a court or some wilful breach of some undertaking that was promised to the court. The second one refers to the criminal contempt of court. This is under section 2 (c) of the Contempt of Courts Act 1971. This happens when there has been a criminal contempt by spoken or written words or using some kind of signs or any type of visual representation or by any other matter or by any other doing by which any court has been scandalized or its authority has been lowered. It has been prejudiced against or has been interfered or has tended to interfere or it has obstructed or has tended to obstruct any kind of judicial proceeding. 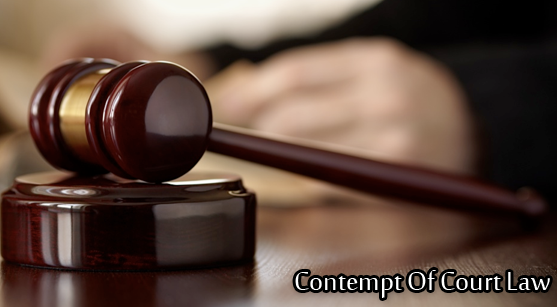 It is also criminal contempt if any kind of action has interfered or has tended to interfere, obstructed or tended to obstruct any kind of hindrance in the administration of justice. It also clarifies that “High Court” means it is the highest court of a state or a union territory of the Union of India and includes all the courts of judicial commissioners in any union territory. Now, there are two sides to look at the case. If you are the party that is being falsely accused of contempt of court, be it civil or criminal, you will have to take the matter very seriously. If proven guilty, then you are looking at severe or exemplary punishment. The best way forward is contact an advocate immediately. This should be done as soon as one can and preferably someone with considerable knowledge and experience in the field. The advocate will provide you invaluable consultation and would be the person to make or break the case for you. Another aspect to it is that you feel that your opposition party is doing something, which is equivalent to being in contempt of the court. Be civil or criminal. Just to be sure, consult with an advocate and apprise him or her on the matter at hand. Make sure you understand your legal standpoint and realize how strong or weak your case will be. Upon receiving practical advice from your advocate, please proceed with what he or she is advising you to do. If you want to register a case again, he or she will be of immense help as the documentation will have to be filed and the case argued in the legal parlance.